Think of digital marketing, and all that knocks your mind include content, social media, and mobile. Right? Well, it’s good that you are aware of the essentials of successful digital marketing, but do you know how to implement these constituents in your digital marketing efforts? Well, for this, you need to create a digital marketing framework, following which you can put a step forward towards a successful digital marketing strategy. Yes! Creating a superlative plan or framework ensures successful online campaigns, and helps you attain the desired results through effective digital marketing strategies. Let us explore the steps following which you can build a successful digital marketing framework. To begin with, you need to spend some quality time and energy in order to drive your digital marketing strategy successfully. Yes! It’s the first phase, and the longest one which needs you to focus on every possible aspect. Though the researching process takes time, if done correctly, you can easily implement the other steps to create a framework. All you need to do is identify goals & objectives of your business, select strategies that can make you succeed at every level, look for some new opportunities, and set your targets. Are you B2B Company? Well, you must be looking for generating leads. In that case if you come under the category of an ecommerce company, you would be more interested in conversions. Analyze well, and reach an objective that you find lucrative for your business requirements. 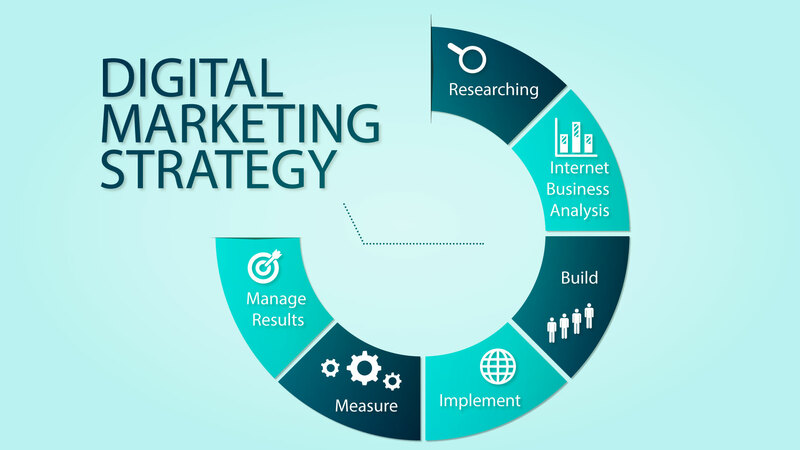 Now that you are very well versed with your goals & objectives, you need to analyse on how you can implement a digital marketing strategy in the best possible way. For this, you need to acquire some valuable information which you can obtain by carrying out some tasks. Firstly, analyse and determine the market that you need to target. Determine the areas that ensure more profit, and make sure to make the most out of it. Secondly, create some fictitious characters representing different types of consumers based on interests, age groups, locations, gender, and demographics. You can now target the different types of customers by using personal campaigns and strategies. This will, indeed, lead you to a better conversion rate and an improved ROI. Moreover, it’s better to examine your competitors in order to track their reputation in the digital space. This will let you know the strategies that they are working upon, and you can, thus, acquire a competitive advantage. Remember, performing an in-depth competitor analysis will give you a valuable information and, you can easily acquire knowledge about the strategies that prove beneficial for your competitors. Moreover, you will also get aware of the areas that can provide you with a more competitive advantage. You can, thus, implement your strategies accordingly, and can acquire the desired results. Set up your digital assets and make a decision regarding your resource planning and allocation. Yes! Carry out a discussion, and get clear of the things like who will build it, what cost it will take, the availability of the staff members to complete the task, requirement of a consultant, and the budget available. Taking care of these things will help you develop your digital campaigns effectively. However, consulting a digital marketing firm can take away all your stress by working on your requirements. Schedule the launch of all the digital assets like social media profiles, website, and digital campaigns, and activate them. A strategy with the well-organized launch can be quite beneficial and can help you attain desired results in an efficient way. Once all your digital assets are activated, you can’t just sit back and relax. Simply building, implementing, and waiting for the results will not work. You need to keep track of the results of the strategies enforced by you. Analyse your strategies and determine the areas that are providing you with better ROIs. If you don’t find yourself satisfied with any particular strategy, just work on it to achieve better results. Or else, you can hire a reliable digital marketing firm that can help you make efficient strategies for the growth of your business. Look for a best digital marketing company that can give you desired results. Mamsys, a digital marketing company, can get you an effective digital marketing strategy that can assist you in enhancing the online presence of your business. Experts, at Mamsys, have an expertise in determining the target goals for every digital tactic. The digital marketing technique helps you in analyzing all the steps and strategies that you have worked upon. Just implement your campaign, run it for a particular period of time, and see how it works. Were you expecting something else? Well, just focus on the strategies applied, give some more time to examine the things enforced by you, and work on them to meet your level of satisfaction. However, if the campaign goes as expected, don’t just be happy about the results. Be active, start the digital marketing framework again, and work on it to enhance it further. Monitoring your digital marketing efforts will help you keep track of the situation, and if required, you can anytime make ongoing adjustments in order to improve your campaign to a great extent. This is the step which, if performed efficiently, assures you the most lucrative results that can provide you with improved conversion rates and sales. Just follow the process given above, and you are ready for the successful completion of all your projects.